Have you ever wanted to travel back in time, to the medieval times of monarchy with beautiful palaces, endless gardens, forts, and castles? 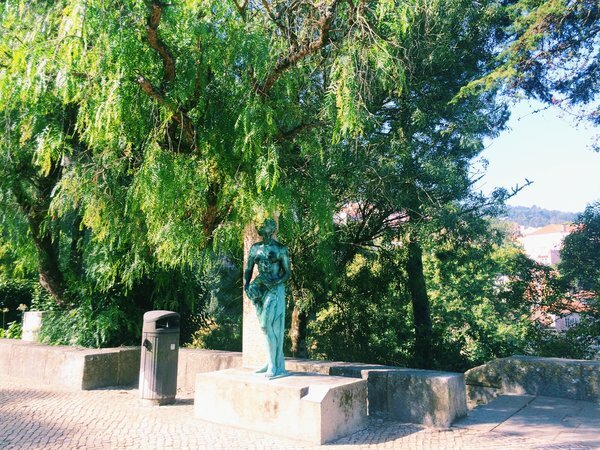 Well in Sintra, better known as a fairy-tale trip back in time, all of this is possible (and more)! From the long outstretches of the green mountainy area to the centuries old walls, stairs, and castles, this town and its incredible features have been preserved and conserved along the years, and Sintra is now a UNESCO World Heritage Site. Although the town is quite small in area, most things are spread out along the mountains and the trips up/down can be quite tiring and time consuming (and this area is very well known by tourists, so tends to be busier in the high season months). We recommend you take either one full (very long, but doable) day, or split exploring this town into two separate days (most recommended). 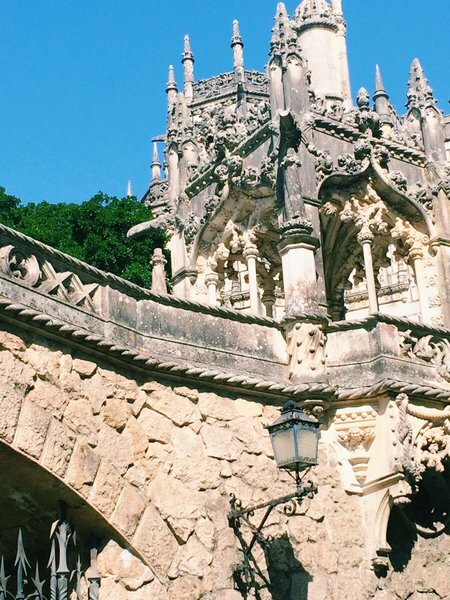 Let us show you some of the most undervalued and overlooked features of this town, such as the view-watch point at the Seteais Palace, the Regaleira Farm (“Quinta da Regaleira”), and the incredible pastries unique to this area. My name is Sofia and I was born and raised in Sintra, and would love if you joined me and allowed me to guide you through my wonderful town. Would you like to get a front-seat view of what you can expect from Sintra? Then make sure to download this travel guide as a PDF and take it with you on your trip! 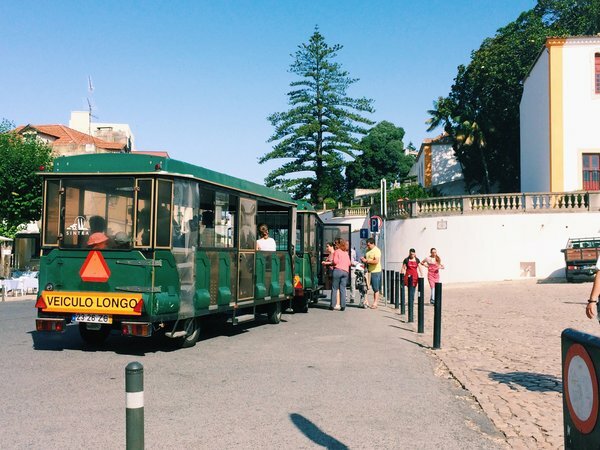 The easiest and most straightforward way of getting to Sintra is by train or bus, depending on where you are located. If you are in Lisbon, train is by far the fastest and easiest option and there are trains from the central station of Lisbon almost every 30 minutes. If you are closer by, in Cascais for example, then buses are your best option and these are very easy to spot/get information on at “Tourist Information” points throughout the city. 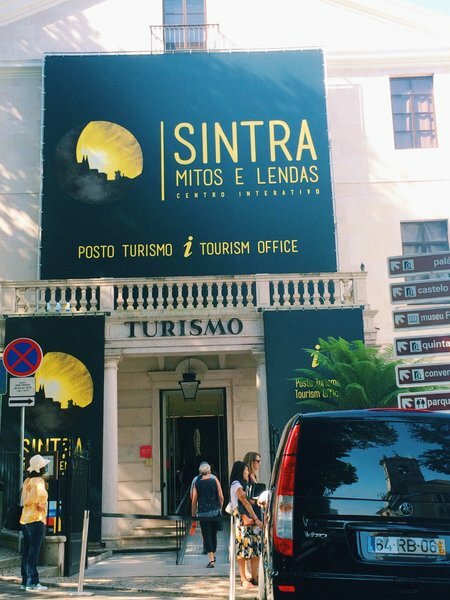 Since Sintra is only a small town it does not have an airport, instead you will have to fly into Lisbon. 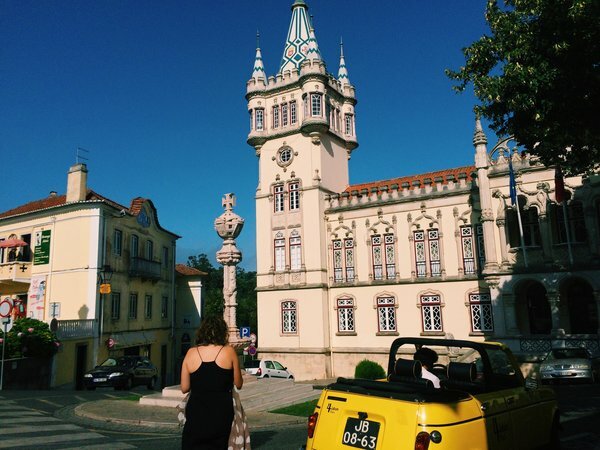 Sintra is also very easily accessible by car, although I would personally discourage this as not only are the parking meters in this town quite expensive (because of the large amounts of people), but finding a parking spot can sometimes be impossible. In terms of accessing all the main attractions, it is very unadvisable to go by car as not only are some of these roads very small and hard to travel on, but many of the main attractions actually have no parking locations. Using the local town buses is your best bet at getting around and about in Sintra. 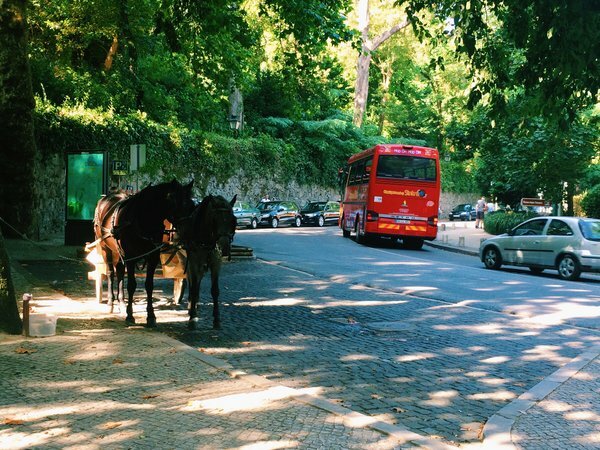 In this pictures you can spot two "best-selling" tourist features of Sintra; to the left a horse carriage, which for a fee carries tourists through Sintra and time to experience Sintra the same way one would have some 80 years ago. To the right, a more modern and redder version of the sightseeing methods, the hop-on hop-off bus. There is also a small and very cute local train that stops next to the National Palace and does a very beautiful route around Sintra, perfect for families with small children, and is not too expensive. Other than these options, you can also choose to hire a TukTuk for a day (great for personalised tours in good weather) or buy a day ticket for one of the 4 Palaces hop-on hop-off buses. This bus does a route throughout the 4 palaces that you'll find in this route, so you can always take that bus to complete this route. The day price ranges at about 12€ with unlimited trips, which is a very good price for this area. Most of the buildings, including the castle, palaces, and extensive gardens, have been preserved to closely resemble their original form and some have even faced very little intervention, taking you in an architectural trip back in time to as early as the 18th century. 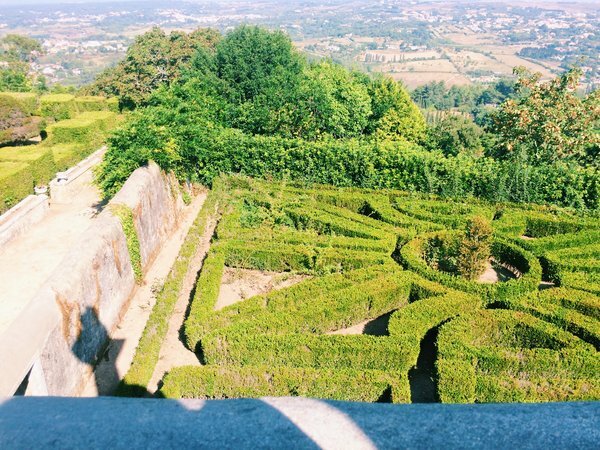 The Quinta da Regaleira, or the Regaleira Farm/Garden, has a labyrinth, stepping stones across the small rivers, an 100 year old fairy-tale like spiral staircase, animals, incredible wine, architecture, and food. Basically, it’s equally great for families, lovers, lonely wolves, and historians alike. The National Palace towers are a symbolic representation of Sintra, sort of like what the Eiffel Tower is to Paris. If you still aren’t convinced, Sintra is one of UNESCO’s World Heritage Sites, one of the most prestigious statuses a location can achieve. Sintra has it’s very own pastries, the “queijadas de Sintra” or little Sintra “cheese” pies. These are small (and unlike the name, do not taste like cheese), have a crunchy outer shell and a soft, deliciously sweet inside (and they resemble small pies). You can even check out how they are made at the Sapa Café (behind the scenes). Note*: all the below listed attractions are open every day of the year with the exception of the 25th of December (Christmas) and the 1st of January (New Years). You can also save up to 10% if you buy tickets online ahead of your visit. 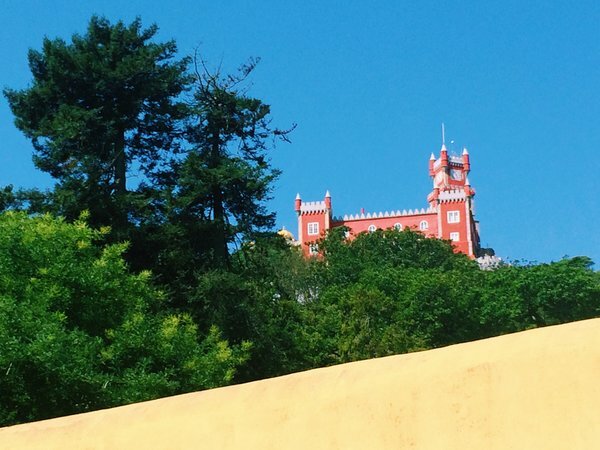 With its renown twin chimney towers, the Sintra National Palace is an unmissable stop. It is open daily*, and the prices are 8€ for adults and 6€ for children and elderly. It is open from 9:30am to 5:30pm (when they accept the last entries). The beautiful castle walls should definitely be on your “to-see” list of your Sintra trip as it is full of historical importance and stories. It is open everyday from 10:00am to 5:00pm (last tickets accepted), and the tickets are priced at 6€ for adults, 5€ for youth (6-17), and free for children under 5. You will definitely spot this palace as soon as you arrive in Sintra, and if it’s majestic structure and colours don’t immediately appeal to you then the gardens and its preservation definitely will. For full access to both the gardens and the palace an adult will have to pay 10€, youth (6-17) and elderly 8€, and children under 5 get in for free. It is open from 10:00am to 5:00pm (last tickets). Please keep in mind that this palace is at the top of the mountain and thus accessing it by car is ill-advised (there is too few parking places). We recommend taking a taxi or one of the several buses that take you to the palace. The Regaleira Farm/Gardens, that you’ve already encountered earlier in this guide, is a beautiful area that really takes you on an incredible trip back in time. From architectural to natural wonders, it’s great for families and lone traveler alike. Children up to the age of 8 don’t pay, students/youth pay 4€, and adults 6€. Guided tours are also available. Sometimes they will hold shows in the gardens such as small operas, and it is open between 10:00am and 5:30pm. We know the amount of palaces in this area might seem overwhelming, but you have to trust us when we say each one is completely different from each other. 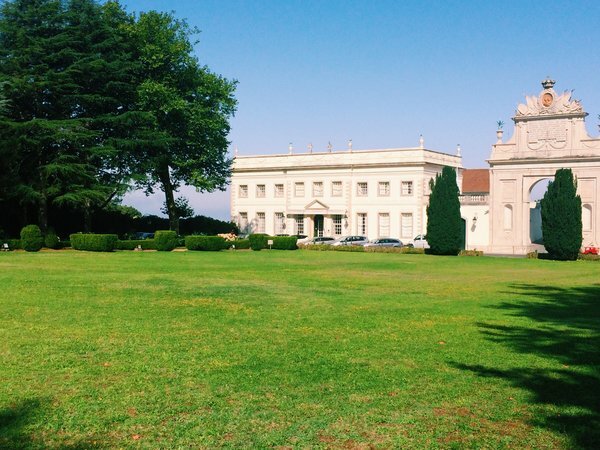 The Seteais Palace’s best feature is definitely the view on the countryside, for example. Since this view is not inside the palace there are no real opening times, and it is free to visit anytime. This farm is a beautiful estate that was once purchased by a millionaire who ordered the construction of the the Clock Tower, thus obtaining its name. Its considered one of the most important monuments in Sintra in terms of architecture due to its Portuguese Moorish Revival style. Unfortunately, it is temporarily closed (with no foreseeable re-opening), but we definitely recommend keeping an eye on it in case it re-opens. Saving one of the best for almost-last, the Monserrate Palace is a personal favourites (and I’m a local!). It’ll make you feel like you suddenly teleported to Morroco, seeing as it is an exotic palace-like villa. It is definitely worth the money, and it is open between 9:30am and 8:00pm. The gardens are also very beautiful and filled with ancient, legendary creatures. The Convent of the Frairs Minor Capuchin was associated with D. João de Castro and his family, the Portuguese Viceroy of India, but became a pious community of reclusive clergy that continued to occupy cramp humble spaces in the complex, until the religious orders were abolished in Portugal. Now, it is yet another beautiful component of Sintra’s World Heritage Site. It is open between 10:00am and 6:00pm everyday, and tickets cost 5€ for adults. In my humble opinion there are 5 (rather small but completely life-changing) experiences you should not miss in Sintra, and only one of them actually costs any money (yay for nature’s incredible beauty)! These consist mostly of views, so choose a sunny day! — A Horse-Carriage Ride: this is the only experience that costs any money but is very worth it. A horse carriage pulled by two horses will take you back in time and throughout Sintra, letting you admire its beauty from a whole different perspective. Perfect for families with children (they’ll love the horses), and for couples looking for a little romantic getaway. — The View from Seteais Palace: walk over to the palace and to the watch point, and you’ll get to admire kilometres of nature into the distance just like in the picture below. — The View from the Bottom of the Mountain: as soon as you get to Sintra, just allow yourself to look up. Try to spot the National Palace towers half-way up the mountain, and then the Moorish Castle and the Pena Palace way at the top of the mountain. Bonus points if you spot them in under 5 minutes! — The View from the Top: after you’ve made your way up, admire the view and try to find the spot you were at when you first looked up! 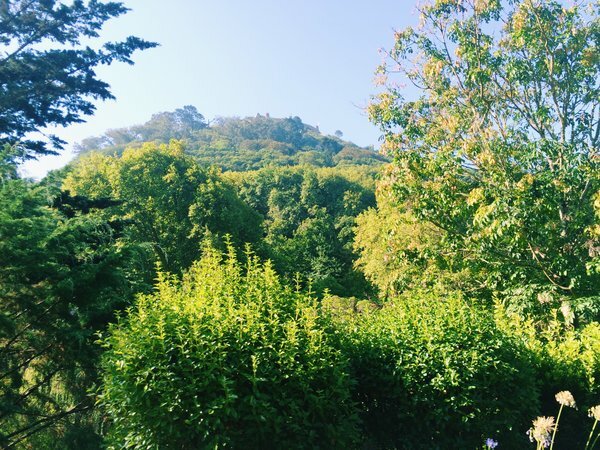 — A Small Walk or Hike: no matter what your chosen method of transportation throughout Sintra is, be it a tuk tuk or the local buses, make sure to take some time in your day to just wander around, hike up the mountain, or take a small walk. No experience is full without trying local foods in ambient environment, and in Sintra we have two very special treats for you which you cannot miss! Travesseiros at Piriquita: The café Piriquita is located near the National Palace (very central) and is very famous for their pastries called “travesseiros.” These have a croissant like texture and an egg based sweet filling, and are covered with a light layer of sugar. These are best eaten warm with a nice cup of tea! 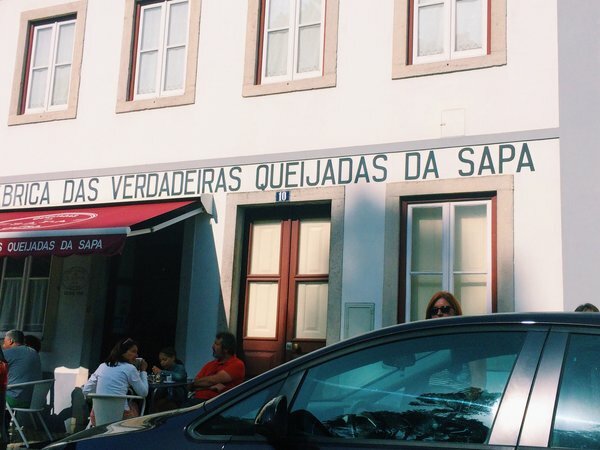 Queijadas de Sintra at Sapa: After walking for about 300 meters when you get to the Sintra train station you will run into Sapa, which has a sign like in the picture below. Walk in and order some “Queijadas” or “cheese pastries.” These have a hard outer shell and a soft, pie-consistency interior, and basically look like tiny little pies. You simply cannot go to Sintra and not taste these for yourself! You can find several pre-made and free itineraries that will allow you to see all of Sintra's main wonders online, however below you will find our two most recommended ones. The first one is one of our very own Sintra routes, from which many of the pictures you've seen throughout this guide were taken. It will show you almost all the locations named in this guide and allows you to do a short or long route, depending on how much time you choose to take in each location. 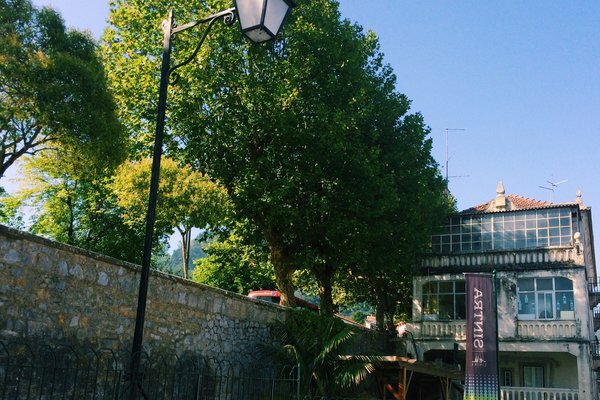 It starts at the Sintra train station, allowing you to follow it smoothly throughout your day. The second itinerary we recommend is the one below, made by locals with several time options (hours or days) and with a full description of how to get to Sintra from several starting points, mainly in Lisbon (near the airport). Cork is, in a way, a Portuguese national symbol due to the various items that Portuguese artisans have managed to create from the material. From simple postcards made of cork to keychains, wallets, and handbags, there is something from everyone. 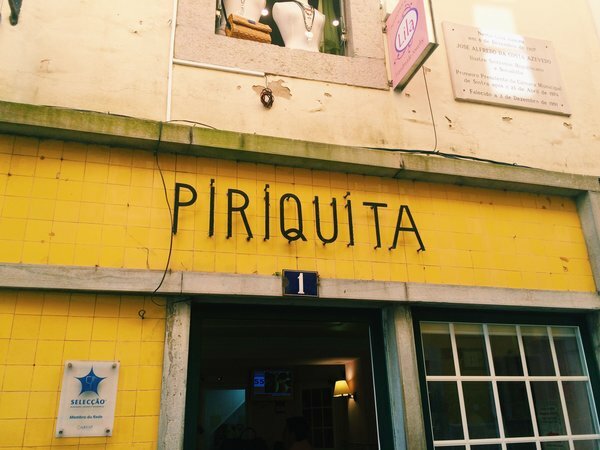 Even though this isn’t exactly particular to the Sintra area, many local souvenir shops will offer these products, which we highly recommend checking out! 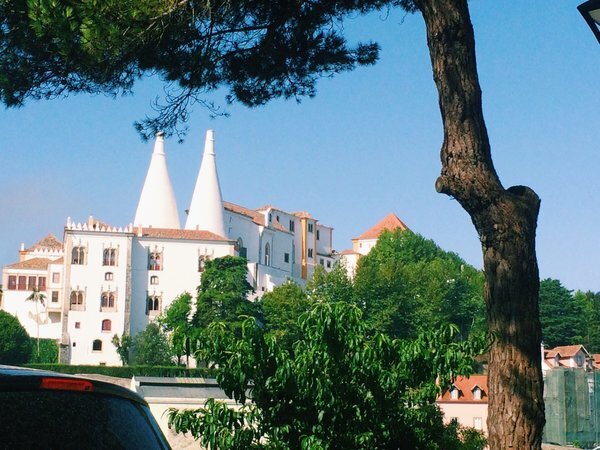 If you are struggling to pick out a postcard, make sure to take at least one that contains the Sintra National Palace chimney towers which symbolise this town. 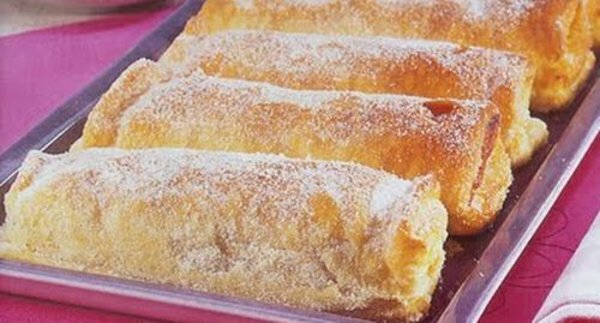 And, of course, take advantage of the fact that the Queijadas de Sintra last quite a while in their packages and take two (or three, or four) back home with you to give your friends a taste of this beautiful town! If I could only give one piece of advice to anyone visiting the beautiful town of Sintra, it would be that public transportation here will be your best friend. While renting a car may seem like a good idea for a mountainy area which requires quite a bit of moving around to see all the attractions, parking spaces are scarce (if not inexistent) at almost all times of the year. Getting to the Sintra Pena Palace, for example, is possible every 10 minutes via a 2.50€ bus ticket, but parking at the palace is almost always impossible. 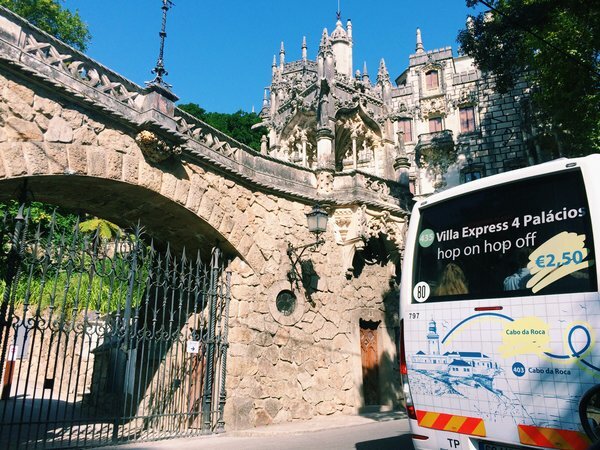 Take advantage of day tickets for the hop-on hop-off bus, and get to Sintra via train. Also, visiting Sintra when it is raining or foggy will take away from your experience as some of Sintra’s best gems are the views and nature. Walking around is also extremely recommended and will be a very uncomfortable experience in the rain. Keep in mind that, even in the summer months, the palaces and castle are located at the top of a mountain, and it does tend to get quite windy, so a light jacket is recommended. If you do not wish to spend a lot of money on meals in Sintra, pack up a lunch at home and enjoy a picnic in one of Sintra’s many natural parks and gardens, which almost always have picnic tables to welcome picnickers. You’ll also find that most of Sintra can be seen on foot (for those who enjoy long walks) when the weather is good, so save some money on transportation, put on some good walking shoes, and enjoy your walk/hike! You can also opt to buy a day ticket for the hop-on hop-off bus and save some money while being able to follow your own itinerary. Sintra has a lot of little local cafés (usually hidden from the bigger streets, so look in the small streets) that offer great prices and will not charge you 2€ for a water bottle. In general, Sintra is a great town for those of us on a budget seeing as you are able to enjoy almost all of its wonders from the outside, from looking up at the Mourish Castle sitting on the top of the mountain to enjoying the views as you walk up. No matter what your budget is, Sintra has always got gems waiting for you! 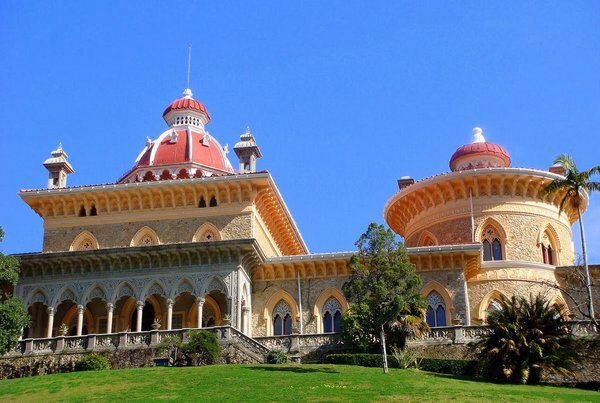 If you’re accommodated in Sintra, we recommend taking a train for a day to the nearby beautiful city of Lisbon. We also recommend taking one of the many buses to the town of Cascais and enjoying the many beaches and ocean breeze. Includes most of the attractions mentioned in this guide, online discounts, travel simulators (to help you get from where you are to your attraction), opening times, price simulators, and a cultural agenda. Enjoy your trip to this beautiful city and do not forget to download this guide as a PDF to aid you during your trip!